Although 'invented' as a mastering technique, the process of running multiple compressors in series has great potential at the mixing stage too. Here, we'll show you to put the idea into practice, by applying two stages of compression to a vocal track. For more unorthadox compression techniques, pick up the February edition of Future Music. Step 1: We all know about parallel compression, blending a heavily compressed signal with an unprocessed one… but serial compression is a different animal. It uses multiple compressors placed in a chain. It was first used in mastering, but we’re using it in a mixing context here. So how is serial compression different to just whacking a single compressor onto a channel in the mix? Step 2: Here’s a raw vocal track ready for some compression. The obvious first step is to throw a compressor on there and dial in some appropriate settings. That’s fine, but we can go one better. Instead, let’s start again with serial compression. This time, we add the compressor with only one intention in mind: scalping the topmost peaks off the waveform - almost like a limiter or clipper. Being so focused in our goal means we can choose a compressor specifically to the task. Step 3: Let’s tackle those peaks. Pull the Attack and Release down to minimum, and activate Lookahead to make sure the compressor clamps right down. The Ratio and Threshold should be fairly high, as we’re aiming to hit just the highest peaks, and hit them hard. With the fast timing and high ratio, be on the lookout for distortion as the waveform starts to get shaved off at the top. Step 4: Now for the second compressor, placed after the first. This will be slower and designed to add character - a classic buss or desk compressor could be ideal. Dial in gentler settings this time: slower Attack and Release times, a lower Threshold and a gentler Ratio should bring the whole vocal into line and give the sound a bit of personality. Step 5: In essence, serial compression is comparable to sub-group or mastering compression, but allows even more control to be taken during the mixing/sound design process. 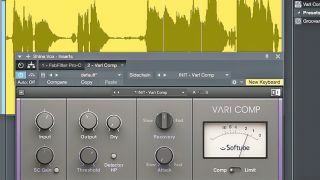 Serial compression won’t ‘just work’ on every track, but it’s a good technique to have at the ready when you need to get the right response, reining in unruly material. We’ve used a vocal for this example because they can be especially tricky to knock into shape. Step 6: The ordering of the two compressors isn’t set in stone. Placing the peak-clipper first, as we have, will help reduce pumping, for example. And why stop at two compressors? Here’s the same vocal balanced with four stages of compression, ranging from very fast timing and high Ratio/Threshold settings, to slow timing and low Ratio/Threshold settings. Admittedly, this is overkill for our vocal but it certainly sounds better than it did before!